To Read the full story by Manuel Mate, please click here to see it on Motorsport.com. Full Story Here. During a hectic Miami Art Basel week, we got a first-look into the new All Sports Motor Network facility where we got to talk with some of the key people behind ARTCELERATION venture and the facility itself. ARTCELERATION a company aimed at blending the art world with luxury racing cars to showcase uniquely painted cars becoming art pieces to be auctioned off with a percentage of the profits going to charities. Neil Handler, CEO of All Sports Motor Network, Patrick Glemaud, owner of Macaya Gallery, and startup entrepreneur Frankie Coletto are partners in the venture. The artists commissioned for this first event are RETNA, Ben Levy and Edouard Duval-Carrie. Ben Levy one of the three artists commissioned. Philippe Hoerle-Guggenheim the director of Chelsea gallery Hoerle-Guggenheim who represents the artist RETNA. We asked them some similar questions regarding their passion for motorsports, how this project came about and how they see this artistic automotive venture evolving in the near future. We first spoke with Neil Handler, CEO of All Sports Motor Network. MS.com: Where did your passion for racing come from? NH: Well for me, my passion is in exotic vehicles, my partner Alain Nadal actually runs the race team [ All Sports Motor Network ] and hes been racing since he was 12. But when we teamed up, we wanted to bridge the gap between my clients who wanted Ferraris and Lamborghinis and be able to give them a track experience and really separate ourselves from your average car dealer. It was about developing a lifestyle for our clients, the auto-enthusiast lifestyle. And what we have here, theres nothing we cant do for our clients. MS.com: Tell us a little bit about this facility? NH: Its a 30,000 sq ft facility that is really a state-of-the-art automotive consortium where we do everything from work with exclusive high performance tuning parts providers like Germanys MTM which specializes in Audi high performance parts. We also have 6,000 sq ft of luxury vehicle storage for our high-end clientele which includes concierge service, climate and humidity control unit, close-circuit TVs, infrared cameras, fingerprint technology connected to the owners license plate number and a 14,000 sq ft garage for our All Sports Motor Network racing team to operate. MS.com: Go through the decision making process in choosing the Ferrari F430 for this event? NH: We wanted to do unique and in a unique way, so when we created ARTCELERATION, there were three founders so we wanted to have in each series, three of the same cars, hopefully do three events a year for three years, so by the end of three years we would have a collection of 27 cars known as the ARTCELERATION Collection. For the first installment we wanted use Ferrari F430s but not just regular street F430s because theres nothing special, so to take racecars that have race history and are unique in their build like the Carbon Fiber one Ben Levy painted was really something that rang true to what we represent here at All Sports Motor Network, to stay true to our racing identity. MS.com: Considering the current impact mainstream brands and their logos have on the sport today, how do you see street art/ contemporary art influencing the world of motorsport racing in the future? 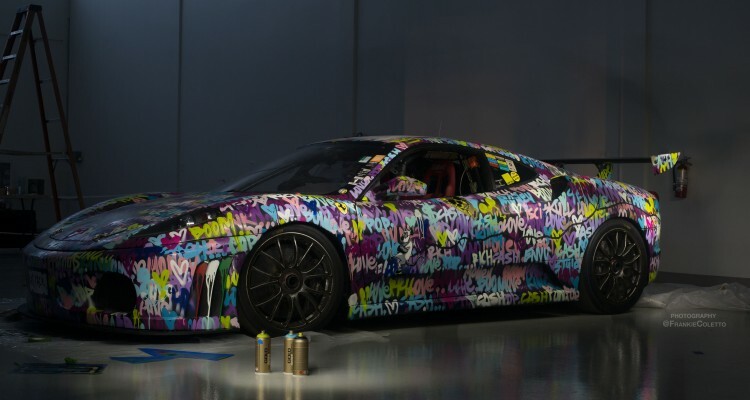 NH: When you have an artist like RETNA who just [painted] the front of building for Louis Vuitton, I cant imagine something cooler than maybe a Louis Vuitton sponsored race car on the track. Or Tiffany, that Tiffany Blue color, its sponsors like these that bring fashion, art and racing all together. And the great thing about it is that we are involving some great charities. The ARTCELERATIONs cars will be auctioned at the end of the week, and a major portion of the proceeds will benefit Miami Childrens Health Foundation of Nicklaus Childrens Hospital and The Interdisciplinary Stem Cell Institute at the University of Miami Miller School of Medicine. The Little Haiti Cultural Center will get the charitable proceeds from the car painted by Edouard Duval-Carrie, who will also donate his fee to the center. MS.com: What is your first memory of motor racing? BL: Probably this! (laughs) or maybe recently Lewis Hamilton in F1. TB: There a place in New York called Hunts Point and we used to drag race there back in the day, illegally at that time. Then got involved in bikes, dirt tracks all of that. Raced Formula Drift for a couple of years, then started my own team, started building cars. MS.com: Who are your all-time favorite drivers? BL: Again, probably Lewis Hamilton, I was lucky enough to meet him in New York with though Tyson [Bradford] a few months back. TB: I would say Mario Andretti is one of my favorites, Dale Earnhardt Sr for sure, and now Jr. Been following his for a while now. MS.com: When you first heard of this project youd be painting on a luxury vehicle what came to mind? What was your idea behind your project? BL: I wanted to vandalize it! I wanted to come in and go against the object. Vandalizing a beautiful, beautiful project. The word graffiti to me, since a kid, was tagging, actual words, I know its a lot more complicated now with people doing huge murals and all but for me you tag your word everywhere you went so thats the idea behind the car. TB: I Never thought it was going to come out this crazy. I remember a few years back the sharpie Lamborghini but this project is just on another level. BL: I see it as a massive opportunity, solely because anything that moves is almost like a moving billboard -doesnt have to stay in one place and you can move it anywhere. When you have something like this is sets you apart from the people you are racing I think. TB: I think its definitely going to make a statement. People are always looking for the different, the edgy. I think most race people are art people, cars are art themselves, so you are bringing to different cultures together that probably have been running together forever but you havent really exposed them in this way. So I think its going to do really well. People can make prints for ths, put them in cars, think Banky doing cars, thats what Ben [Levy] is doing now. MS.com: How did you first get involved with Hoerle-Guggenheim? PHG: I first got involved with the gallery when I met my business partner. We then collaborated and combined resources, including our knowledge of the artists and knowledge of the ways in which the art world works. He had previous experience in the gallery world so it was helpful in creating our brand, and we have maintained the vision of the gallery since the beginning. MS.com: What did you see in RETNA that stood out from the rest of the artists in your roster? PHG: RETNA is a street artist, but is making the transition to fine art. He is a very unique artist and it is interesting to see how his work has evolved from grand scale murals to the walls of an elegantly designed house as well. Not many street artists have been able to do that. MS.com: What do you see in his artistic style that connects with a brand like Ferrari having both their own recognizable stamp/look/identity? PHG: RETNA creates his own language in his paintings, and it is what makes his work so memorable. Both RETNA and Ferrari have something about them, when people hear their names, they often immediately know who and what the brand is. In the same sense, there are also many people who may recognize them, but dont know enough about either and want to learn more. In understanding more about each, the unique image of both brands stays with them. The two stand out and are not easily forgettable. MS.com: What comes to mind when you think of art, Ferraris, Miami? PHG: Art and motors are intrinsically linked, and Miami is the perfect backdrop for both. It is the perfect combination, especially during the week of Art Basel, when everything comes together for one week. MS.com: Can we, the fans, expect any future collaborations between Hoerle-Guggenheim, RETNA and the world of motor racing? PHG: The gallery looks forward to representing RETNA and his work, and we hope to host similar events and partnerships with him in the future. Right now we have partnered with Aston Martin to exclusively receive a collection of limited edition cars and we will be working with them on a unique collaboration.